Routinely engaging in a variety of cardio, upper and lower body strengthening exercises provided by this station while in a natural setting can improve muscular strength, endurance and overall wellness. The Multi-Gym provides the opportunity to create a full body work out by combining Push-Up, Chin-Up, Horizontal Chin-Up and Plyometric Box stations into one cohesive and compact station. All component pieces are made with durable powder-coated steel that resists corrosion and wear and tear. The Plyometric Box surface is a marine grade slip resistant plastic designed for all weather use. This low impact, body resistance fitness station is a great tool for all ages to practice specific exercises or create a circuit styled workout. 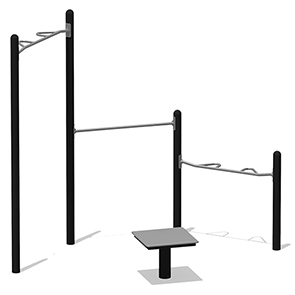 It also allows for concurrent use by multiple users and encourages group fitness.